Syifa trying my phone camera. Zaki! Tinggi nya ko! That was Ihab’s first word when meeting me. Kurusnya ko! That was Syifa’s impression when first seeing me that day, agreed by Hazlyn. I love to hear what people would say about their first impression when they see and meet me face to face. Not to say I love to hear compliments only, but people’s first impression is important to me to go long with the meeting. Ok, end of the first impression thingy. 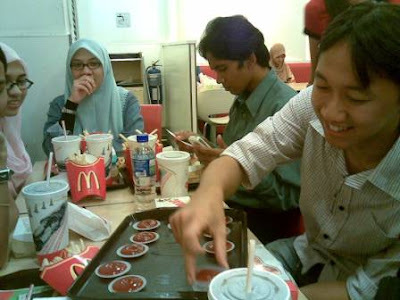 It was 29th September 2007 where we met and sat together at MidValley’s McDonald after coordinated by Ihab to see his blogging friends before he actually flies back to UK to go for another one year studying as medical student. I was late that day for 2 reasons; ONE: I came all the way from Kuantan direct to MidValley and my bus was stuck in traffic jam. SECOND: what made it worse was that I dropped by Central Market beforehand to buy souvenirs to them which took about 20 minutes to let the artist to paint wordings on the keychain. Haha... so Hazlyn. 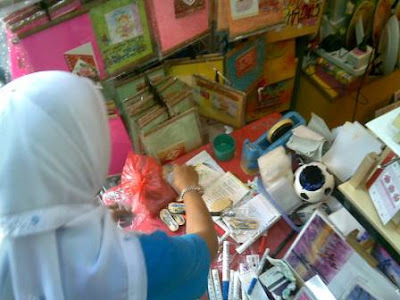 I was not only performing solat there, but I went there for other purpose – buying souvenirs! Once reaching MV, I straightly headed to McD and I didn’t find anyone I might recognize there although I’ve gone from table to table! And neither the people recognized me! Hey! You said McD, but where are you guys! I sent Syifa and Ihab SMS telling I was already there saying “I am man in red”. I waited not long after suddenly a man about my height said, “Zaki! Tinggi nya ko!” That was Ihab. He was so comforting like we’ve been meeting for years! While breaking fast we continued chatting and chatting about range of topics until, again, to an extent they almost didn’t realize Isyak was just around the corner. We stopped there and immediately run to the musolla where we found it so packed with people. Lucky me, I got rukhsah so I could do solat jama’ takhir later. 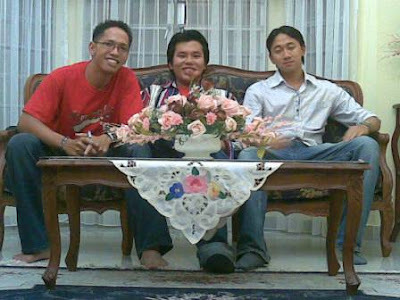 This is where I spent time with Ismat, updating about himself who is now a consultant in an international company (fuyoh!) and about the cat-and-dog behind his career. Fooh... now I wonder how would I ended being an employee one day. We dispersed that night from where the guys followed their way with Ihab’s car while the girls for some shopping I think. Owh yes, there was another guy joining the iftar, Anas – Ihab’s adik angkat. It’s a long night in that gathering and I was so happy to see all of them especially the coordinator – Ihab, since he’s the one arranging the meeting and opportunity to see him was a golden one because after this I’m not sure if I can see him again because he’ll be going back to UK next week. All the best there bro! Thanks to Wan who willingly sent me to UIA Gombak although it was late already. 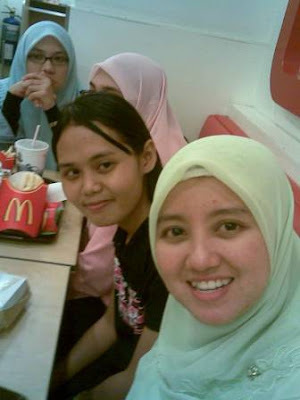 That’s where we updated about ourselves especially about Wan’s job as part time lecturer and employee in a ministry. It was my first experience using express bus from Kuantan to KL and forth. If not because of the gathering, may be till now I won’t know how ticket bus looks like. I always drive to go back and forth Kuantan-KL previously. Besides keychain, I also gave them kad raya as gift. During waiting for the keychain to get done, I dropped by McD nearby the CM to find a comfortable place so that I can write and sign on the cards contentedly. I've listened to Ihab singing live and this guy can sing effortlessly well! That explains why artists feature him in their songs. Go to his blog and listen to the background song. In Ihab's house. Motif ko pejam mata Ihab? ohoooo...dapat gak kejar 'orang yg b'lari ' tadi. elo dik!! !kjadian 'prtemuan' tsebut pd 29 sept @ 29 okt??? nmpak sangat tergesa2 ada org nak wat entry ari ni. amboiiii..sanggup bkorban travel Kuantan>KL than balik KL>Kuantan. WHUAAAAA!!!! !NI bab yg tiba2 hatiku tak berkenan..JELEEEESSSSS OKEYYYYY!!!!! ko tak citer pun pasal first impression aku: "makan hati dlm diam tgk ko slim giler"
saya mmg adventurous la.. haha.. ulang alik kl-kuantan dalam 2 hari, takde hal la..
tu la.. dalam hati tertanya2 gak ape citer kak ila kan~ ye la.. kot2 dia dijemput sekali. akupun takmo pandai2 ajak kak ila pasal aku tak tahu ihab kenal kak ila ke tak~ sori kak ila.. Syifa!!! really..smemangnya akak tak dapat yr sms. la.. ni ape cerita ni. sorg kate da sms. sorang kate tak dapat sms. what ever la.. mende da lepas. huhu..
Dah agak dah. Mesti Zaki beli keychain tu kat CM. Takde la bulat sgt pun muka KakShifa tu. Okay what? Meh pass daging/lemak tu kat org. Kak Ila jgn la jeles. nanti ko balik malaysia bebila bagitahu ek.. mane tahu kot2 kita bleh arrange kuar makan same2. ajak dinie sekali. mesti best! ahahah.. kantoi aku~ kalau bulat pun muka si syifa tu, ape masalahnye? lawa ape.. kan lyn? jeles siot! jeles lagi dan lagi dan lagi! anyways congratulations for the meeting hehe... i'd give anything i have to be at the meeting unfortunately i cant. gathering tu memang best! first time aku face to face dengan dengan ihab dia da mesra cam aku dah kenal dia sejak kecik. muahaha~ yang lain2 pun best gak. masing2 banyak mulut! blogger la katekan kan~ huhu..
lain kali kalo ko balik malaysia (ke sekang ko mmg kat malaysia already?) kabar je kot2 kite bleh arrange meeting and gathering camni lagi.. aku teringin gak nak jumpe baez, nad, acap.. hm.. sape lagi.. sume dak2 yg aku kenal melaui blog ah. mesti havoc! Aku pejam mata tanda terharu gila ngan usaha gigih ko nan tulus murni nak bersua muka ngan kami.. Akan ku kenang selamanya Zaki!! Akan akan dan AKAN!! Many thanx for the great Iftar Jama'ee.. Without u.. It wouldnt be as fun.. Ensyallah!! Ukhuwah lillah forever and ever!! Again, many many thanx!! GOD BLESS!! & Selamat Ari Raya!! Kad raya aku dah sampai lom?? haha..